Synchronous motor have field poles on the stator winding or rotor and 3Φ armature on other member. (based on the size and capacity of machine). Field poles on rotor are preferred construction for high voltage machine otherwise high voltage leads have to be taken out through three slip rings placed on the rotating member, causing difficulties of insulation and conducting current through the contacts rubbing on the rotating slip rings. Further, a synchronous motor may have salient (projecting) poles or cylindrical poles with field winding distributed out, an arrangement which is preferred in high speed alternators run by steam turbine. As this relationship holds under all operating conditions, the speed of synchronous motor is called the Synchronous Speed. The induction motor has a stator which is 3Φ wound, similar to the synchronous motor. 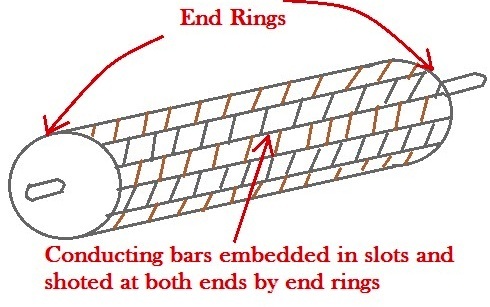 The rotor in an induction motor carries secondary winding which may be merely a set of copper bars shorted out at each end or a not properly wound rotor with three winding connections brought out through slip rings and shorted externally. These differences in construction leads to two types of induction motors- squirrel cage and slip ring types. An induction motor with its primary(stator) excited causes a rotating field in the air gap with consequent induction of currents in the shorted rotor conductors. Torque is developed by the interaction of rotating field and he rotor current. The motor runs at subsynchronous speed which somewhat reduces with load as compared to a synchronous motor which runs at synchronous speed at all loads.